Choose from hundreds of ultra-fast VPN servers for P2P sharing. NordVPN not only allows P2P traffic – it also protects your private data every step of the way. P2P stands for Peer-to-Peer networking. It is one of the fastest and most convenient ways to share files with large groups of people. Normally, each user would download a file from one server or a network of servers. With P2P, each downloader also becomes an uploader, making the process of file sharing much more efficient. pushing software updates to massive user bases – even Microsoft does it! That being said, you still need to think about safety measures while sharing or downloading files from a P2P network. The main issue is that every device uploading or downloading the same file on a P2P network can see each other’s IP address. That’s the very nature of P2P – it wouldn’t work otherwise. So what’s great for efficient information sharing is not that great for your privacy. Besides, your internet service provider can also quickly detect that you’re using P2P. They may deny access to file-sharing websites or set bandwidth limits, which slows down your internet speed. With these risks in mind, if you use P2P, VPN should be your best friend. When you enable a VPN, you connect to a remote VPN server, replacing your real IP address with that of the server. This IP swap hides your location and helps you stay private while sharing files or simply browsing the web. When you use a VPN, your ISP can’t detect that you are sharing files and shape your connection accordingly. This way, you can avoid the annoyance of bandwidth throttling and internet roadblocks. With a VPN, P2P files and all other data you send and receive travels through a strongly encrypted tunnel. That means no one can get their hands on your private information. What is a P2P-friendly VPN service? Many VPN providers discourage you from using their services with P2P. But even those that don’t may not be a good choice for file sharing. A strict no-log policy to ensure that your online activity always stays private. Reliable encryption protocols to guarantee the stability and protection of your sensitive data. No bandwidth or speed limits – you don't need a VPN provider who throttles your connection the same way your ISP would. Kill Switch to protect your IP address from being exposed in case your VPN connection drops. Some VPN providers limit your file-sharing activities by throttling your bandwidth and slowing down the connection. NordVPN has no bandwidth or speed limits – we have no intention to meddle with your internet connection. 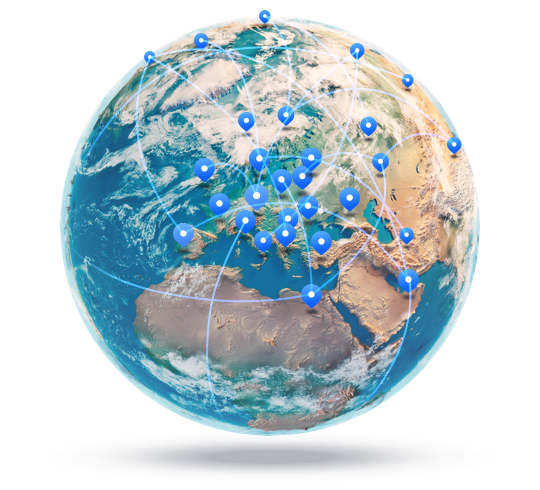 Instead, NordVPN provides P2P servers – there are hundreds of them in different locations around the world, optimized for file sharing. So you can enjoy the fastest and most secure VPN experience anywhere and anytime. In case your VPN connection has any issues, the automatic Kill Switch feature makes sure that your IP address is never exposed. It either shuts down the apps you have selected beforehand (such as file-sharing services) or disables your internet access. On top of that, NordVPN protects the files you download and everything else you do online with military-grade encryption. And if you don’t want your ISP or anyone else to know you use P2P, NordVPN doesn’t collect any data on your online activity. Even if someone asks, we have no information to provide.